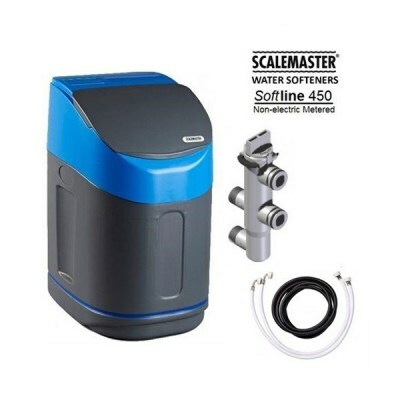 he Scalemaster Softline 150 represents a new approach to household water softeners. The Softline 450 unit is non electric, which eliminates any problems to do with electrical installation compliance. The unit operates purely through the hydraulic pressure on the incoming water. As a result, the softener will be able to function even during blackouts or power cuts, ensuring softened water anytime. Due to being non-electric,The Softline 450 has no motors and no wires. The moving parts are operated by dynamic pressure above 0.8 bar. The Scalemaster Softline 450 has taken proven technology and greatly improved it. 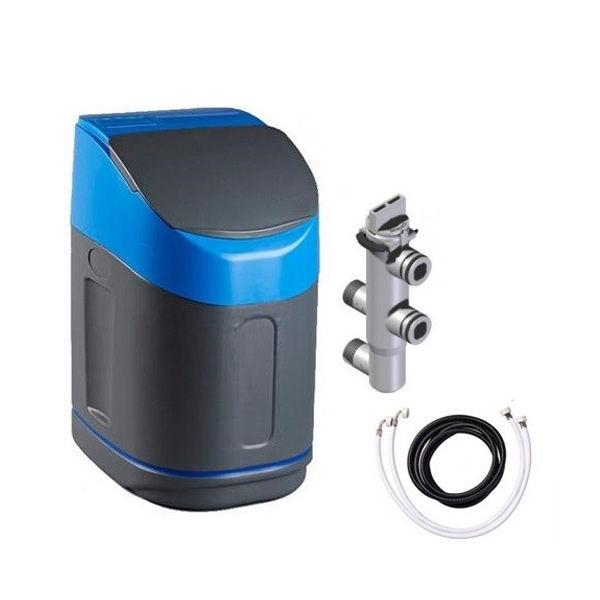 The 450 has been designed to be easier to install and operate than other water softeners on the market through the use of an innovative ’clip-connection’ system and a patented design integrated bypass valve. The 450 features integrated screens, packed bed technology and use of an ISO-Standard resin to allow fr efficient softening at a high water flow rate, ( and low pressure drop), unachievable by many other softeners. The Softline 50 unit is one of the most efficient softeners on the market. Through it’s advanced technology, the Softline 450 typically only uses 330 grams of salt and 18 litres of water for every regeneration making it one of the most environmentally friendly water softeners on the market today. Water usage is less than 4% per regeneration which meets the minimum performance requirements of the Code for Sustainable Homes published by the Buildings Research Establishment. The 450 operates purely through the hydraulic pressure on the incoming water. As a result, the system needs no electricity which eliminates any problems cause my blackouts or to do with electrical installation compliance. 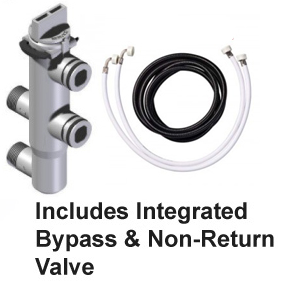 Due to its unique and innovative 'clip-connection' system, the system is a lot easier to install than other softeners on the market. The 450 has been designed to be able to fit into a standard sized kitchen cabinet, and also other areas in the house where space can be an issue. The 450 only requires you to set the water hardness level for your area and then the system is ready to use. The 450 is designed to only use 330 grams of Salt and 18 litres of water during regeneration. The Softline 450 is WRAS approved and all valves are wet tested before leaving the factory. Nominal flow rate (1 bar loss of pressure) 25 litres per minute (1500 litres per hour). Fabricated from high grade engineering materials, the Softline 450 will deliver quality softened water for many years to come.